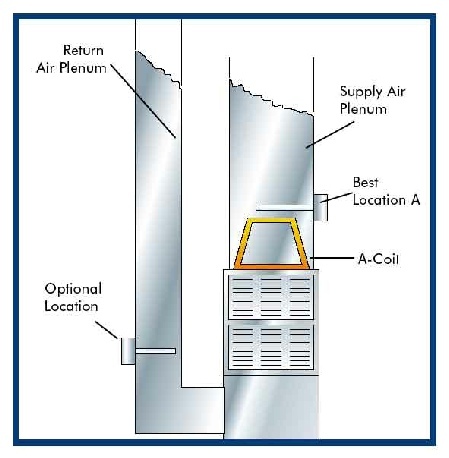 If you have central air conditioning, it is recommended to place the UV lamp just above the A-coil to help control mold growth on the coil. Otherwise, placing the UV lamp just ahead of the electronic air cleaner is also an effective location. Notice: This is a 2-year bulb recommended to be cleaned with a damp cloth annually and replaced every two years. DMUV kit without the panel. Electro Breeze 1 inch electronic air filter with the duct mounted UV light is your economical and effective fresh air purifier for homes with central heat and/or air conditioning. These whole house air purifiers remove particles down to 0.3 microns and kills live viruses and bacteria (What is a micron?). By incorporating the UV germicidal lamp into the system, Electro Breeze is considered a UV air purifier. These UV air cleaners are going to address all of your indoor air pollution problems. Odors are carried on particles. Getting rid of particles is no problem for most filters, but odors also generate from bacteria. You can smell mold as soon as you walk into a room. The Electro Breeze UV air cleaners attack mold and bacteria as well! The ease of installation of the home air cleaner and ultraviolet light makes this a perfect fresh air purifier for new construction as well as retrofit to older homes. Ease of maintenance and affordability make this combination just right for any age or income group. Click here to see the dramatic effects of coupling the Electro Breeze air cleaners with UV germicidal technology.